I recently had to visit the emergency room here in Reno. I was lightheaded, I had a foggy brain and I thought I might have had a stroke. I had met with some investors at 10:00 that morning, and, during the meeting, I couldn’t remember the name of our fund Guardian. You can see in the chart below that 1946-1948 marks the first big spike of births that initiated The Boomer Years. 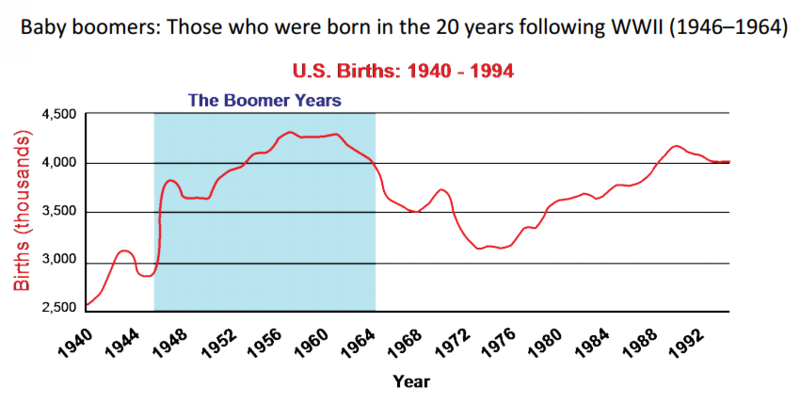 After 1948, the boomer phenomenon experienced a 4-year lull, then, from 1952-1962, births rose again before tapering off slightly. A quick look at the math shows us that early Boomers (those born in 1948) are turning 69 this year, while late Boomers (those born in 1962) are turning 55. Fast forward to the present day, with our largest ever population of aging individuals who need… well, let’s just say that they have a lot of needs. This is the number one reason we are starting Hughberry Senior Living, our assisted living properties. Though we might not like to think about it, the need for quality senior care is tremendous. With these realities setting in, we must address the healthcare dilemma that is going to rock our country if we can’t figure out a solution. Like all economic matters, it is complicated, but I believe there is a solution — one that can solve almost any problem concerning money. But before I get to that, let’s look at a few statistics on health and health care in America. Over 85% of older adults have at least one chronic condition. The average older adult has three chronic conditions and is on five prescription medications. By the age of 75, 33% of men and 50% of women engage in no physical activity. There are a lot of problems with the American diet and our lack of daily activity; we know this needs to change. I don’t have a solution for it other than to educate people as best we can. 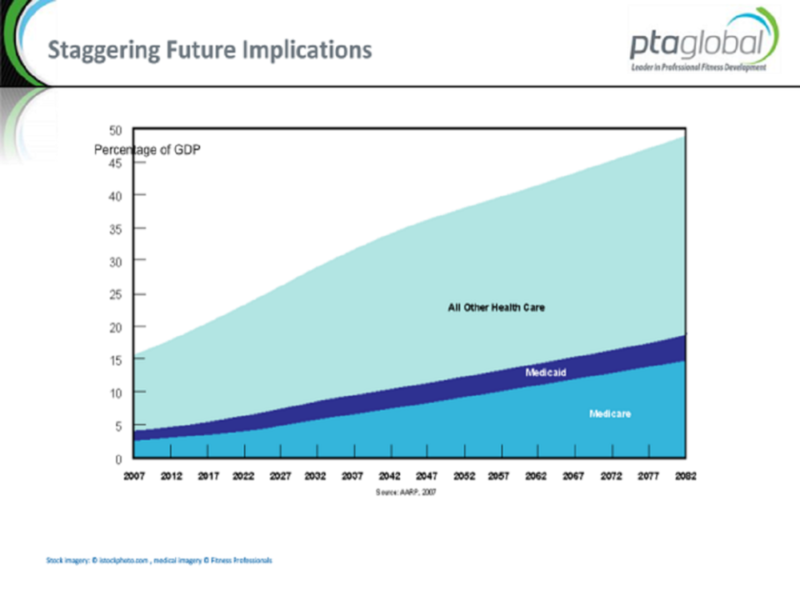 Take a look at the chart below, showing how healthcare costs are expected to rise over the next 65 years. This chart and the ones above are from PTA Global, a nationally-accredited professional fitness development organization. Do they have an ax to grind? Yes, but theirs is not political. The point they want to make is that we all need to stay active, or things are just going to get worse. No matter how you slice it, we are not going to be able to sustain government-paid health care at the rate we are going. One thing that always destroys a market like health care is government interference. It quickly becomes over-regulated and made into an entitlement program, sucking the free market right out of the system. Once the insurance companies and other agencies are involved, doctors can’t even tell you how much a procedure is going to cost you until after it’s done. How are you supposed to be able to make decisions? Name one other business that doesn’t give you pricing up front. When you get an estimate from a contractor, do you just say, “Sure, that all sounds good,” without at least considering the price or shopping for a better deal? Three years ago, my wife Tanja needed an MRI on her head. I knew that, whatever it cost, it was coming out of my family’s pocket. In our case, we were able to call around for pricing. Even then, it was a challenge to get any straight answers. Prices ranged from $3,200 at the hospital, to $1,800 at a private facility in Reno, to the one we chose, which cost $450 in Sacramento, two hours away. Ironically, since we went out of state to save money, the insurance company wouldn’t even count it towards our deductible. Does that make any sense at all? Remember the economic solution I mentioned earlier? It has to do with the free market. Without some kind of competition that is free-market driven, health care is just going to become more and more expensive. People need to reach into their own pockets and pay for at least part of their medical costs themselves because we all know “free health care” does not actually mean “free.” The thought of we the taxpayers paying for our aging population’s health care, with no say or control over the cost, sounds pretty scary! To finish my story, thank goodness I didn’t have a stroke. I had played racquetball earlier in the morning and slammed by back into the wall really hard, giving myself a concussion without knowing it. I figured that out as my brain fog cleared and all my tests came back looking good. I was released four hours later and sent home with an $8,000 bill. Fantastic.